Now that the festive season of partying and extravagance is over, now’s the time to take a breather with a return to some of the calmer things in life — tea, coffee and books. 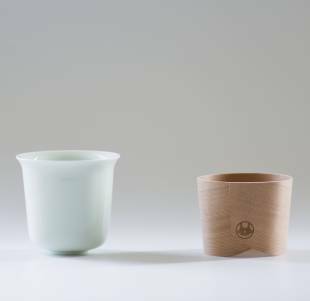 Though contemporary and understated in style, everything about Hakata Magemono Lab’s Haori Cup is a masterstroke of traditional craftsmanship. 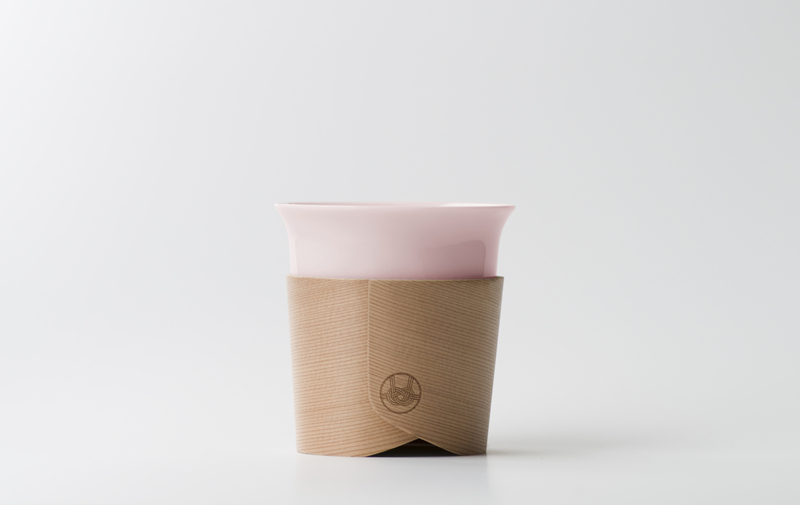 The cup itself is high-grade Hasami-yaki porcelain, while its complementing Japanese cedar sleeve is crafted by Shibata Toku Shoten — one of Japan’s last two ateliers that produce Hakata Magemono bentwood containers. The sleeve design is inspired by haori kimono-style jackets and is branded with one of eight choices of Japanese mon-like motifs — all of which are based on traditional patterns, such as the egasumi cloud haze and the mizuhiki symbolic knot. Aside from brown for coffee, even the cup colors evoke Japanese symbols — green for tea, white for sake and pink for cherry blossom. Of course, all this is not just aesthetic. 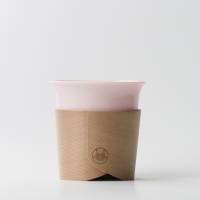 Like a paper coffee-cup sleeve, the Haori Cup’s cover serves as a grip that also protects the hands from hot beverages and absorbs condensation from cold ones. Originally designed by Tomoya Nasuda as a Kickstarter campaign for sales overseas two years ago, the Haori Cup is finally making its debut in Japan via the crowdfunding site Makuake. A pledge for one cup is ¥5,940 ($48 if buying via the overseas online store). Also about to make its debut is the Grand Prix winner of the 2016 Hizen Yoshida Yaki Design Competition. Hizen Yoshida-yaki — ceramics produced in Ureshino, Saga Prefecture — have a history of more than 400 years, and the competition helps introduce the region’s potteries to new and contemporary designs, as well as offer opportunities for young creators to see their ideas reach production. The Grand Prix winner — the Private Roaster created by Takeshi Hamana of 807 Design — is a handy pan for roasting coffee beans over a stove. 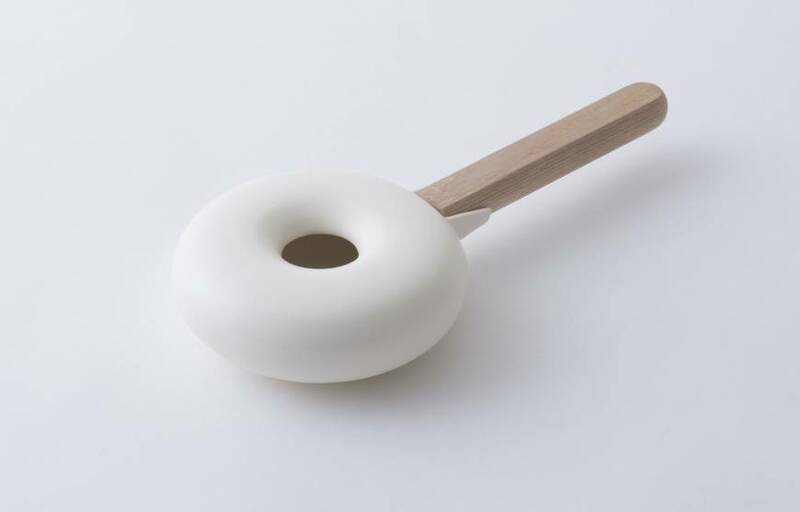 It looks a little like a hōroku (a traditional ceramic pot-like pan used to toast sesame seeds and tea), but its flatter, more doughnut-like shape helps it better distribute heat and avoid spillages when tossing contents side to side. The Private Roaster’s significant design difference, however, is its solid wood handle, which has an indent that hooks into a slot on the side of the pan. Once you have finished roasting, you simply unhook the handle, then push it into the top opening of the pan and use it to lift the whole container. The side slot then doubles as a spout so the beans can be poured out. This means that your hands never get too close to the hot ceramic, but also the roaster can be compactly stored away. 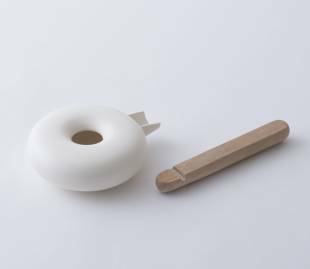 Made by 224 Porcelain, the Private Roaster can roast up to 150 grams of coffee beans and is priced at ¥9,720. There are plans for its release in mid January. For more information, keep an eye on the Hize Yoshida Yaki website. Sometimes the simplest ideas are the hardest to produce. 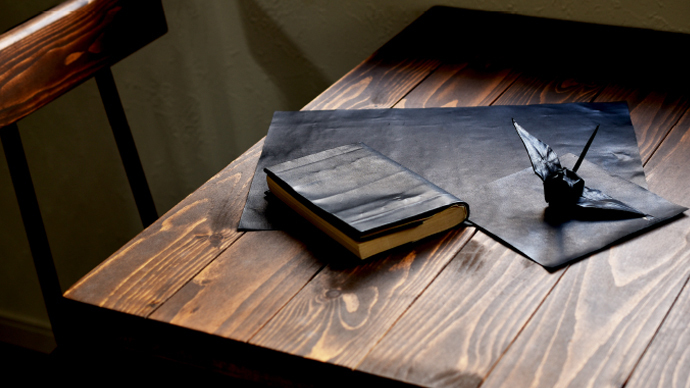 Changize is essentially a thin sheet of leather that can be wrapped around books as dust jackets or folded into origami creations. That may not sound so impressive, but when you consider that it is wafer thin yet doesn’t rip when manipulated, and that it maintains folds but can also be ironed flat to be reused, you know this isn’t an ordinary piece of leather. Changize is a labor of love by a Himeji leather tannery, online retailer Asoboze and Tokyo leather artisans, who used a skiving machine on the same pieces of leather repeatedly — a task that takes immense skill — to create sheets at just 0.4 millimeters thick. That’s the thinnest that the artisans discovered could be treated with extra oil and wax to become supple and strong enough to withstand multiple folds. But the creators didn’t stop there, more experimentation was also needed to get dye to penetrate the additional oil and wax for a range of rich colors. The result is a flexible product that can be used as gift-wrapping, dust jackets and almost anything you can create from origami. Available in natural tan, two shades of brown, red or black, Changize can be ordered via Makuake at ¥12,400 for a 25 x 35-cm sheet. Asoboze plans to ship to its pledgers in March.